It was an ordinary day at the office for Paige Langle (’13, Wildlife). 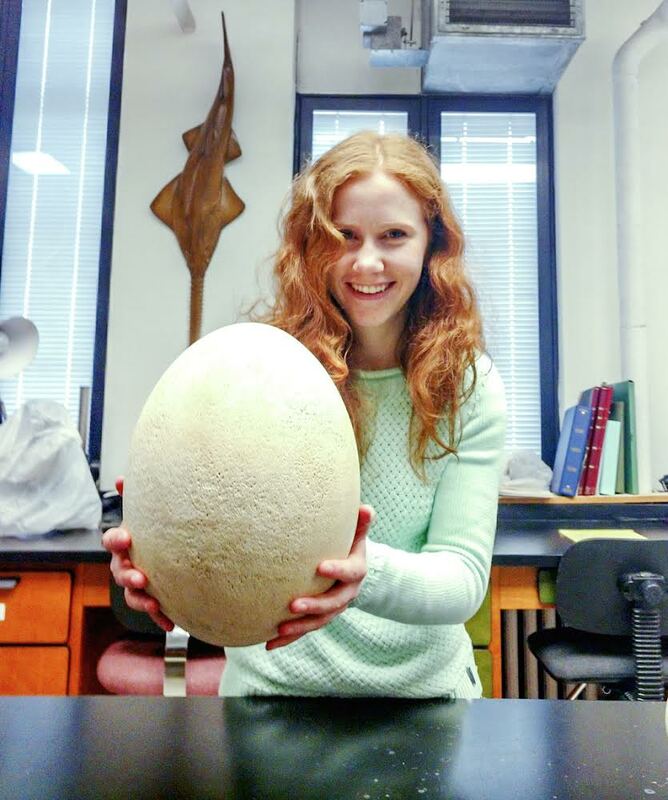 That is until Langle, collections manager of zoology for the Buffalo Museum of Science, made an extraordinary discovery: a gigantic, and rare, egg from the extinct elephant bird. Before the elephant bird’s disappearance in the 17th century, coinciding the arrival of humans in its territory in Madagascar, the largest of the creatures stood 10 feet high and weighed up to a thousand pounds. Langle’s big find—a foot in height and 28 inches around—came about during an inventory of egg and nest specimens, part of an ongoing effort to digitize the museum’s collection. An assessment by an imaging expert confirmed her hunch: It was a real egg. Her finding is now the centerpiece of the museum’s “Rethink Extinct” exhibit. It is one of only 40 intact elephant bird eggs in a public collection. Langle originally planned to work with live plants and animals as a wildlife biologist. She caught the collections bug in a Humboldt State mammalogy class where she learned what research museums have to offer beyond what the museum-going public sees. The opportunity for hands-on work in campus museums and a summer internship at the Smithsonian’s National Museum of Natural History helped inspire a career redirection. Langle also credits HSU’s small class sizes with enabling her to build valuable personal relationships. As Langle continues her quest to bring her museum’s collection into the digital age, she points to the lessons she’s learned about the potential treasure trove of knowledge for researchers among the musty boxes and unopened drawers. Like a massive elephant bird egg.